Sunderland are reportedly planning a summer bid for Liverpool outcast Sebastian Coates, who has seemingly impressed enough during his loan move to convince the Black Cats to push for a permanent transfer. * After some 'impressive' performances at the tail end of the season, Sunderland are 'hopeful' of signing Coates this summer. * Liverpool want to sell Coates, who cost the Reds £7m in the summer of 2011. * Leicester City are also interested, and scouted Coates during Sunderland's recent 0-0 draw with Arsenal, which played a vital part in the club avoiding relegation. Coates - hailed in December as 'fantastic' by Gustavo Poyet - has made just 12 Premier League starts for Liverpool since 2011, so it's obvious that he's a dead man walking at Anfield. With Lovren, Skrtel, Sakho, Toure, and Can in the squad (plus the possibility of another defender arriving this summer), there's probably no chance of Coates making a breakthrough. As such, leaving is probably best for his development, and future career. That said, did Liverpool make a mistake sending Coates on-loan? Liverpool could've saved the £20m and just had Coates in the squad, and I doubt he would've done much worse than Lovren. Clearly, Coates has what it takes to make it in the Premier League, but only 10 League appearances all season tells its own story. The Reds have enough injury prone players at the club, and after two major injuries in one year (including a cruciate ligament tear), selling the Argentine is probably a good idea. As always the question to ask is this: will losing Coates make any negative difference to Liverpool's forward progress? As harsh as it sounds, the answer is emphatically NO, and sacrificing him for much-needed extra cash makes sound transfer sense. On a serious note Jamie, now we have gone and insulted skrtel with a "unexceptable" contract offer. What is happening at LFC. Buying crap players for crazy money, missing on on great players who are cheap or free. And insulting our top players with joke contract offers. Talk about creating a bad vibe in the changing room. "With Lovren, Skrtel, Sakho, Toure and Can in the squad..."
Can is a midfielder, and he reaffirmed that his favourite position (and the one that he'd like to play) is in midfield and he has been selected as a midfield for the German U21 squad for the U21 Euro. There's also Ilori coming back from another loan and it's time to make a real decision with him (either sell him or keep him). I could not have put it better myself. I'm so worried about next season. We are light years behind the top 4.... People are actually getting excited about Milner. Have we sunk that low. I'm convinced there is a very good defender in Coates, but think it is for the best that we move him on now. Just hasn't worked out for the lad. Small print is too small, what does it say? In what sense? He's our best defender in many area, based on nothing but the facts. In any other case, I honestly doubt I've heard anyone mention something about Skrtel being the best in the EPL or one of the best in the world. A buy back clause seems to be ideal here. Put on 10-15M if he comes good. Ah, didn't realise you were dyslexic. Wasn't trying to be insensitive. Had I realised you were dyslexic, I'd have simply demanded you were banned from the internet. Wisdom just signed a new deal too, and his future should probably be at CB, though RB could be a possibility. I'm not insulting him? My point is that he's not a massive loss if he goes. Sorry man, didn't mean, you insulted him. Was saying no need for Lfc to insult him. And how many times can we say "no massive loss". No massive loss that sterling wants to go, insert Suarez/Gerrard/hendo/skrtel/anger/reina.... Doesn't it worry you? yeah, but players like Suarez and Gerrard are on a completely different level to Skrtel. You can't compare. Skrtel is good, but his big problems are getting bullied by large strikers, and his communication. His teammates have no idea what he will do next because he doesn't communicate with them. For example, he has a tendency to sit deep, so when they're playing a high line, he'll drift back without notice and then create gaps and confusion. So you're not missing on any top managerial prospects. If anything, if Roger/LFCs doesn't preform by Christmas we have a shot at Klop coming to the Kop. 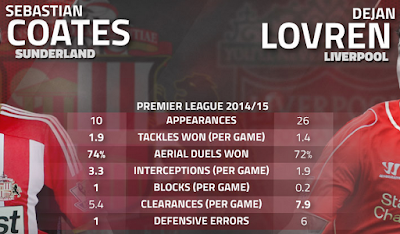 I seriously don't know what are things Lovren can do that Coates cannot. Likewise for the pair of Luis Alberto and Suso. These are rocket sciences that are far beyond my reach. I'm trying to figure out who is doing this... The fact that he has 1 year left is crazy. What is going on? What kind of business sense it this? I think it's just the trend of getting rid of all of our experienced stalwarts, bar the one Rodgers brought in, that's worrying. Lucas has also been fighting the chop for a while. I fully expect Coates and Ilori to be tried at Liverpool before any more new CB's are brought in. Wisdom too. Work with what you have Brendan, you've spent enough. hes Uruguayan not Argentine + i still think he would be good for us rather than buy a new defender. He'll dig his heals in saying he wants to prove himself at Anfield, end up playing no football and then fading into obscurity..... No, wait, thats Borini.. It's for the best mate. It had to be done. Not even close. Put skrtel in a back for and he is terrible. He leaves his partner it to dry all the time. He was at fault for so many goals that have been pinned on sakho it's ridiculous. The back 3 allowed skrtel to show case his bullish nature while taking away is inability to cut out passes and his lack of decision making. if he goes, who should come, on your opinion?